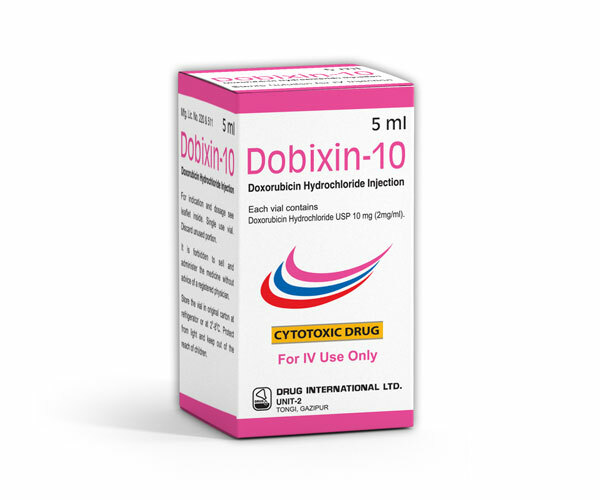 Dobixin- 10: Each vial (5 ml) contains Doxorubicin Hydrochloride USP 10 mg Sterile Injectable Solution for Intravenous use. 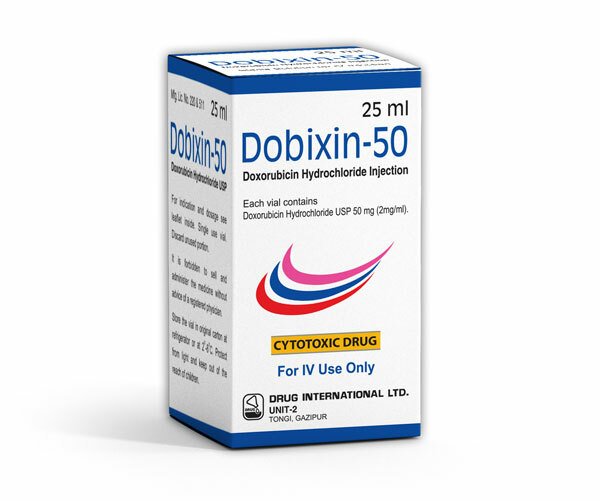 Dobixin- 50: Each vial (25 ml) contains Doxorubicin Hydrochloride USP 50 mg Sterile Injectable Solution for Intravenous use. Indications : It is indicated for the treatment of acute lymphoblastic & myeloblastic leukemia, Hodgkin & non-Hodgkin lymphoma (NHL), metastatic breast cancer, metastatic Wilms' tumor, metastatic neuroblastoma, metastatic soft tissue sarcoma, metastatic bone sarcoma, metastatic ovarian carcinoma, metastatic transitional cell bladder carcinoma, metastatic thyroid carcinoma, metastatic gastric carcinoma & metastatic bronchogenic carcinoma. The recommended dose is 60 mg/m2 administered as an intravenous bolus on day 1 of each 21-day treatment cycle, in combination with cyclophosphamide, for a total of four cycles. i) The recommended dose of Doxorubicin HCI when used as a single agent is 60 to 75 mg/m2 intravenously every 21 days. ii) The recommended dose when administered in combination with other chemotherapy drugs, is 40 to 75 mg/m2 intravenously every 21 to 28 days. iii) Consider use of the lower Doxorubicin dose in the recommended dose range or longer intervals between cycles for heavily pretreated patients, elderly patients, or obese patients. iv) Cumulative doses above 550 mg/m2 are associated with an increased risk of cardiomyopathy. Or, as directed by the registered physicians. Please see prescribing description for more information. Use in pregnancy and lactation : Pregnancy Category D. There are no adequate and well-controlled studies in pregnant women. If Doxorubicin is to be used during pregnancy, or if the patient becomes pregnant during therapy, the patient should be apprised of the potential hazard to the fetus. Women of childbearing age should be advised to avoid becoming pregnant. Dobixin- 10: Each box contains one vial of Doxorubicin Hydrochloride USP 10 mg Sterile Solution. Dobixin- 50: Each box contains one vial of Doxorubicin Hydrochloride USP 50 mg Sterile Solution.